Posted on July 1, 2010 Posted in 2010, Canada Day, iPhone photos, Ontario, Toronto	. While walking home last week, I saw this sign up at a local restaurant. It was so cute and endearing that I had to take a picture if it. I’m today’s world, it’s not very often you see a business close up shop for a actual vacation. Far too many of us work day and night, Monday to Friday – barely able to function, let alone recuperate on the weekend… Only to do it all again on Monday. It made me smile to see this sign. So what are you doing right now? 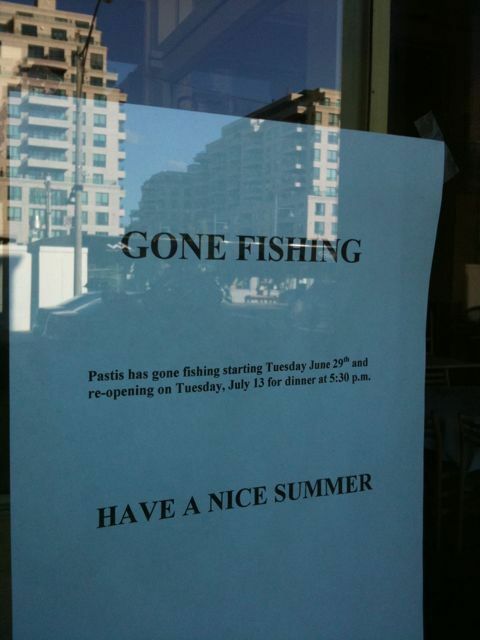 Gone fishing? If not, any special summer or vacation plans. Posted on May 10, 2010 Posted in 2010, Cascade 220, iPhone photos, Toronto, TTC	. 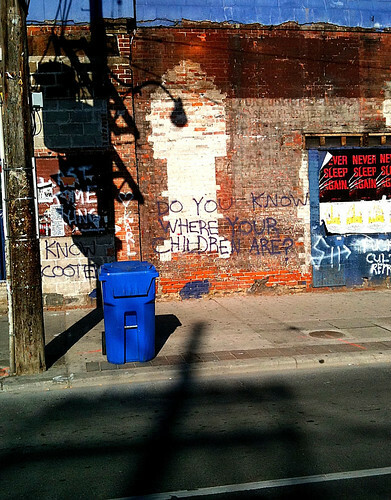 As the graffiti asks: Do you know where your children are? I saw this earlier today after popping into Romni Wools for a skein of pink Cascade 220. While waiting for a streetcar, this sight caught my attention and drummed up some questions. Why did they write that question when the rest of the graffiti on the wall is pretty random? When was this written? Was it last week, or a few months ago? I’ll confess I don’t know the lifespan for graffiti on an old building in downtown Toronto. Does it handle weather well? Do most buildings get this stuff removed if it’s worth their time? So many questions left unanswered. But I’ll still keep asking and will probably come up with a few more questions. So tell me… do you know where you’re children are?